Sunday Soul | The Arts Community Center | Food & Drink | Style Weekly - Richmond, VA local news, arts, and events. 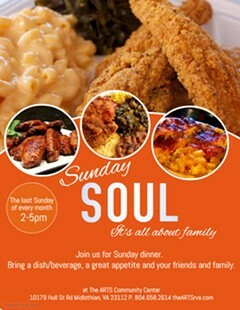 When: Last Sunday of every month, 2-5 p.m.
Join for Sunday dinner. Bring a dish and or beverage, a great appetite, your friends and family. Food, fun and laughter for all.